The 7.5 Gallon TouchTop™ Wastebasket features a sleek profile and polished finish. The slim shape is designed to fit into narrow spaces and the lid orientation features the latch on the short end of the rectangular base. TouchTop™ lid opens with a touch then shuts securely to keep contents concealed and smells contained. 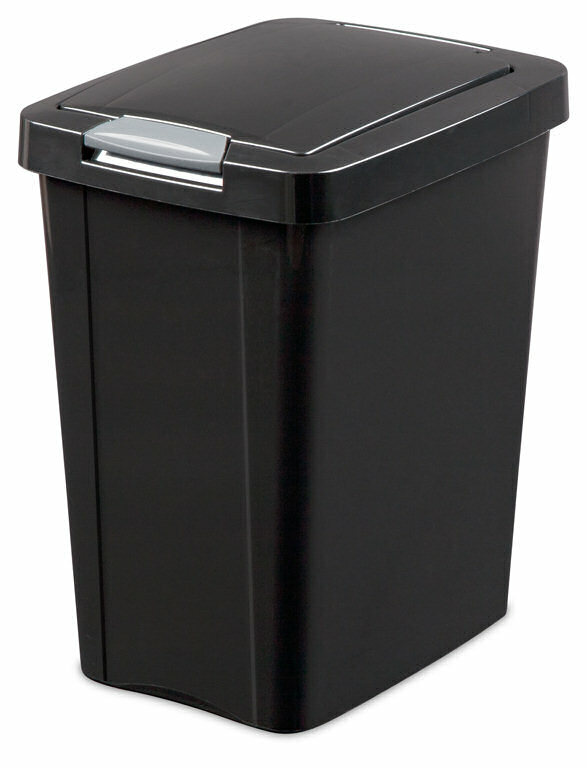 The TouchTop Wastebasket fits a standard 8 gallon trash liner, or it can be used as a recycling bin. 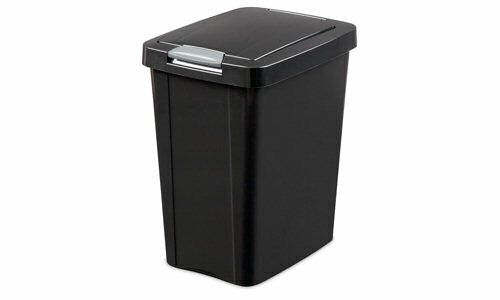 This Wastebasket is ideal for all areas of the home including bathroom, bedroom, mudroom, office and even the kitchen. The overall dimensions of this Wastebasket are 14 1/2" L x 11 1/4" W x 17 3/4" H.
Overall Assembled Size: 14 1/2" x 11 1/4" x 17 3/4"
Ideal for use in small apartments or dorm rooms where space is limited. 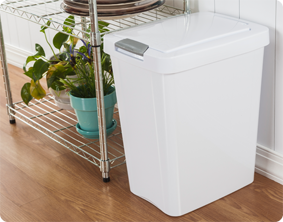 7.5 Gallon TouchTop Wastebasket is rated 2.7 out of 5 by 36. Rated 4 out of 5 by Bootaz from I like it I will buy this one the next time I replace the kitchen can I have now. It will be a better fit for the space the old one is in. And that won't be long before I replace the old one! Rated 1 out of 5 by Reggie from touch top mechanism broke after 1 1/2 years The plastic touch-top mechanism broke after 18 months. The plastic simply wore out. The rest of the wastebasket and lid are in fine shape; however, if you want a wastebasket with a lid that remains closed, this is not the lid for you. With the broken plastic latch, the lid pops open. I have to keep something on top of it for it to stay down. Rated 5 out of 5 by BigMac from Improved Latch, Great Service I've had this for about a year, using it as a small recycling bin in the kitchen. Like many others have mentioned, my latch failed after about nine months. I contacted customer service and they immediately sent out two brand-new latch assemblies. it looks to be a more robust design that should last a long time, and I've got a spare. it's good to know that Sterilite stands behind their products if there's a problem. Rated 1 out of 5 by splusb from The latch on the lid broke in a few weeks after purchase. If you could come up with a better design for the lids I would be so happy. I like the size of the small waste basket. I have it in my bathroom. I only had it a few weeks and the lids broke. It won't close now, have to have a bottle of shampoo on it to keep it closed. Sad. I read that this is the case with many other reviews. Sorry but had to tell the truth. Rated 1 out of 5 by MoBetta from The Worse This trashcan is poorly made, like all the other reviews the latch gave out in a short amount of time. In my case I had the trashcan for a month. Customer service was willing to send a replacement part however for the price I would rather cut my losses. Do not purchase!!!!! Rated 4 out of 5 by JohnT from A good product backed by good customer service I can’t recall how much this trash can cost, but I’m sure I didn’t pay much for it. I use it outside my kitchen door regularly and after a period of time, the latch wore out and would not keep the lid down. RATHER THAN CRYING AND COMPLAINING ABOUT IT, I CONTACTED THE MANUFACTURER WHOSE GRACIOUS CUSTOMER SERVICE REP AGREED TO SEND A NEW LATCH. Within a week I had the new latch and installed it within 5 minutes. Problem solved! No grief! No undies in a bunch! Easy solution to a simple problem! Didn’t even have to up my meds. Rated 1 out of 5 by marieceleste from bad design on lid closure lid closure broke after short period of use and no way to fix. bad design, do not purchase if you want a functional lid. they should replace w/other type of lid. like the bronze color and size. Rated 1 out of 5 by Steve71 from Poorly designed lid - breaks easily To echo what most other reviews say about this product - the lid breaks easily with only moderate use. I had the wastebasket for only about 5 months before the latch started to crack and would no longer keep the top closed. I just asked Sterilite to send me a replacement.